The drone was smaller than i thought it was going to be but it did not disappoint, it is a really fun drone with a surprisingly good camera. I really like the altitude old function; it makes it so much easier for a beginner to use. The auto take-off and landing feature is also nice additions, this was definitely designed to be beginner friendly. Overall it’s a great flying drone, I personally would like to see this model with a 5.8 ghz wifi video transmitter instead of the 2.4 because the altitude hold and slower movements would make for a better video taking quad. Being 2.4 ghz still doesn’t take away from the drone as it is loads of fun just the same! HD Camera – Equipped with a stationary 120º Wide Angle 2MP Camera that films everything in its path in 720P high definition. Micro SD card and SD card reader are included for easy uploading and sharing. Custom Route Mode – Pilots can now create custom flight routes by simply drawing the desired flight path directly on the Flyingsee App. The drone will then fly according to the created line. First Person View and VR Headset Compatibility – Designed with an enhanced WiFi feed for a more instantaneous video transmission. Drone and controller will sync immediately upon powering on. Altitude Hold – Set the quadcopter to hover at your preferred altitude. This makes controlling the drone much easier and stabilizes the camera. Long Flight Time – Includes (2) 3.7V LiPo batteries to double your flight time. Each one lasts 5-7 minutes and can be charged quickly and easily via USB on site. 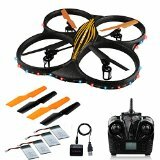 Great Drone for Beginners – It features 6 Axis Gyro Stability and a High/Low Speed mode making it easy to fly for novice and expert pilots alike. The controller itself has been beautifully crafted to fit the pilots’ hands with easy-to-access controls. Headless mode makes easier flight: Once the fuselage direction can not be recognized, it can enter headless mode so as to continue the flight. One Key Return Home Funtion: Avoid lost aircraft and bring drone back with the simple push of a button.